Bella Figura is a light installation inspired by the joy of spirited driving, celebrating the journey across some of the world’s most exciting roads. 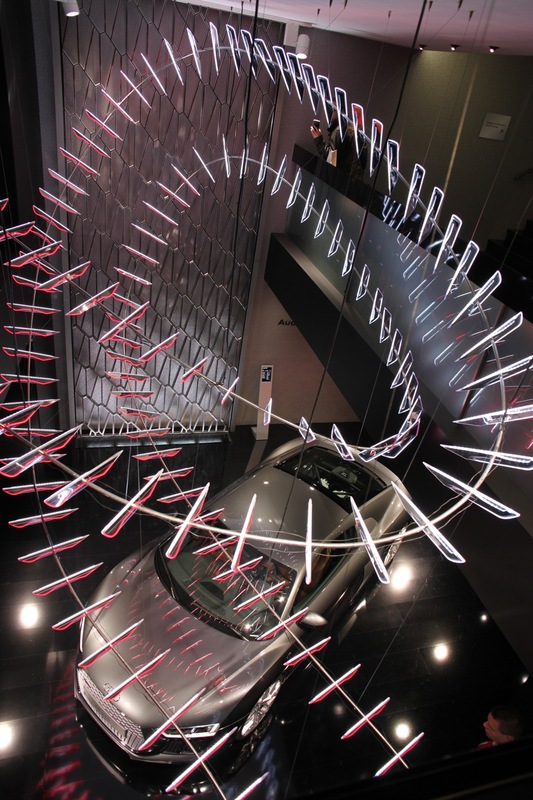 The installation traces through time like an Audi through a night time photograph. Visualising an elegant curve, it celebrates the moment of finding the perfect line during a late night drive. 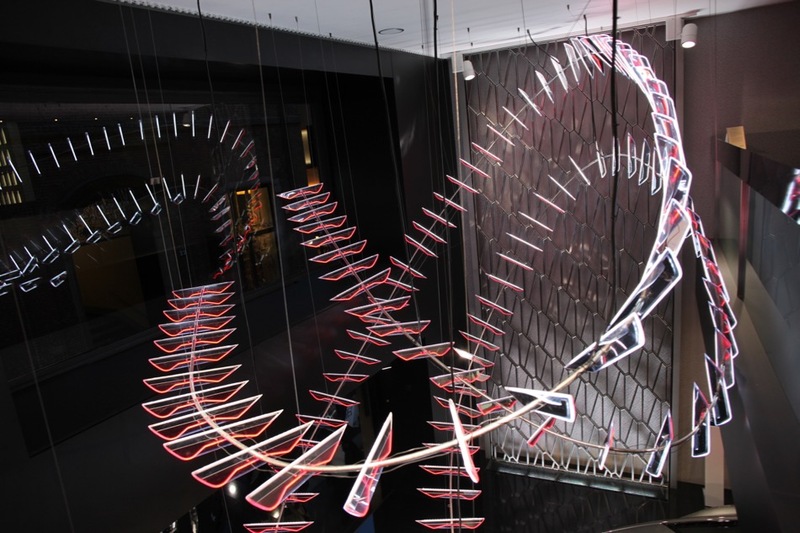 More than 200 elements are affixed to an elegantly rail system, tracing the journey of the light. Cool white and vibrant red LEDs are affixed front and back referencing the head and tails lights of the vehicle on its journey. Inspired by long exposure photography, something Moritz has experimented with in the past, the installation is a three dimensional version of a long exposure photograph. 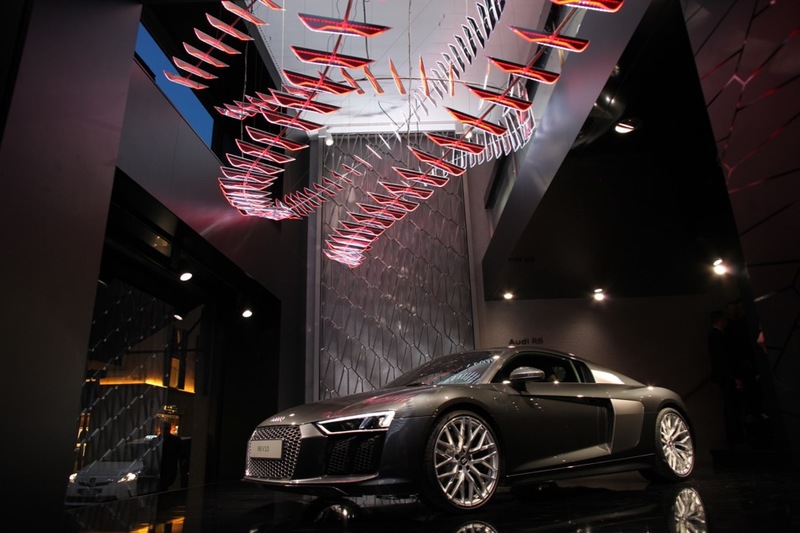 The parallel tracks curve dynamically throughout the space of the Audi City Lab coming to a peak following a dramatic curve in the double height space above the Audi R8. This entry was posted on Monday, April 27th, 2015 at 4:42 pm. It is filed under ALL PROJECTS, LIGHT DESIGN. You can follow any responses to this entry through the RSS 2.0 feed.